The Jefferson fracture is a complex burst fracture of the ring of the atlas (C1) (see figure below). This fracture pattern was first described by Geofrey Jefferson. 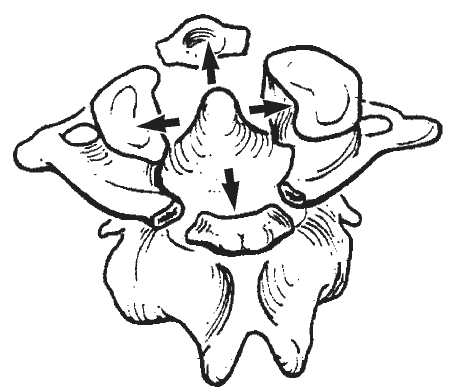 Classically, it involves fractures of the anterior and posterior arches of C1 on both the right and left sides (4 fractures). But fracture variants may include two or three-part fractures. Nearly 1/3 of Jefferson fractures are associated with a fracture of C2. There are other types of Atlas fractures, than that of the Jefferson fracture. To review them, and also get more information about the Jefferson fracture, visit: Atlas fracture. There is usually no cord compression and associated neurologic deficit, because the fracture widens the ring of C1. 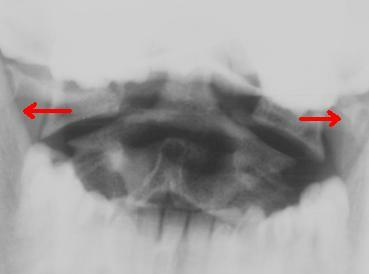 There is usually lateral spread of the lateral masses of C1 vertebra on C2 at open-mouth cervical x-ray (see figure below). The jefferson fracture typically caused by an axial loading on the head. The trauma most frequently occurs during diving into shallow water, vehicle accidents, and falling onto the head from a height. Conservative (collar for 2-3 months) or surgical (occipitocervical fusion) treatments are available. The treatment selection depends largely on the degree of offset of C1 on C2 and whether there is damage to the transverse ligament.